Being an ideal place to soaking up the sun, relaxing and the unique and relaxed ambience that dominates this place, Sanya Bay is surrounded by amazing tropical scenery with a boundless sea view. The local life here reflects the richness of traditional costumes, music, dance, food and handicrafts. Sanya Bay is lying to the west of Sanya city center, the longest bay in Sanya with 20 kilometers seaside avenue, honored Asian Fisrt Seaside Avenue. 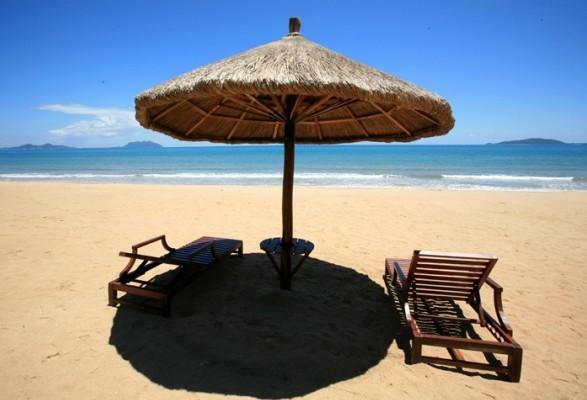 It has the most beautiful sunsets of Sanya and is safe for swimming as the sea is calmer. Also, it is a better choice to live here to taste the daily life of local people. Across the Sanya bay sea, you will see two adjacent islands: Western Hawksbill Island and Eastern Hawksbill Island (commonly know as Western Island and Eastern Island). The Eastern Island is a garrison island with strict safety measures while the Western Island is open to the public. If you are interested in angling, you can reach the Western Island by motorboat as it has the biggest and best angling club of Sanya. There are many fish and you will return with great success. Furthermore, the island is famous for its limpid sea water and various benthoses, popular for experience of scuba diving, and water sports. It is a relatively undiscovered premier tropical destination. This is just about the only place in China with a really laid-back feeling and atmosphere. Whilst enjoying your private time, unlike many other locations, you will see more life of the local people. During the daytime, scattered older people stand along the shore to do fishing. During evening time, a lot of local people sit under the palm trees and look at the vast South China Sea. The gentle breeze tenderly touches their hair and forehead. The colorful local life here reflects the richness of traditional costumes, music, dance, food and handicrafts. There are three kinds of dances including the dance preformed with fans and scarves, a very stylized ballroom dancing and an interesting form of line dancing. All of these dances are done to traditional and contemporary Chinese music. Along Sanya Bay, there are a lot of local seafood restaurants where tourists can try the authentic seafood such as crab, shrimp, squid, clam and fish. The night market here is especially lively with seafood thrown on the streets, stores selling all types of weird and wonderful wares, all adding to the chaotic feeling about this place. As Sanya Bay is not far from the city center, it would be a good choice to wander along the bay after dinner to feel the soft sea breeze and warm sea water, and view the sunset. Also you can see lots of local people doing exercise at the beach after the sunset. You can also see the fishermen trawling and hear their working songs resounding to the skies. Moreover, you may rent a bike to go sightseeing along the Avenue. Not only will you be able to enjoy the fresh air and the beautiful view of Sanya Bay, but also can make fitness at the same time.